The 2018 Toyota Camry mid-size car is as stylish as it is practical. With standard Toyota Safety Sense™, the new Toyota Camry makes safety the most important mission, but it still offers powerful and efficient engines, a sleek exterior design, and innovative and intuitive cabin technologies, like the available eight-inch multimedia touchscreen and available 10-inch color Head-Up Display. The 2018 Toyota Camry is available at ten trim levels: L, LE, XLE, XLE V6, SE, XSE, XSE V6, Hybrid LE, Hybrid SE, and Hybrid XLE. If you crave a practical car with a sporty edge, then the 2018 Toyota Camry deserves your consideration. It offers powerful engine options in a sleek exterior, but still features modern technologies and, most importantly, a safety suite designed to prevent accidents from even happening. 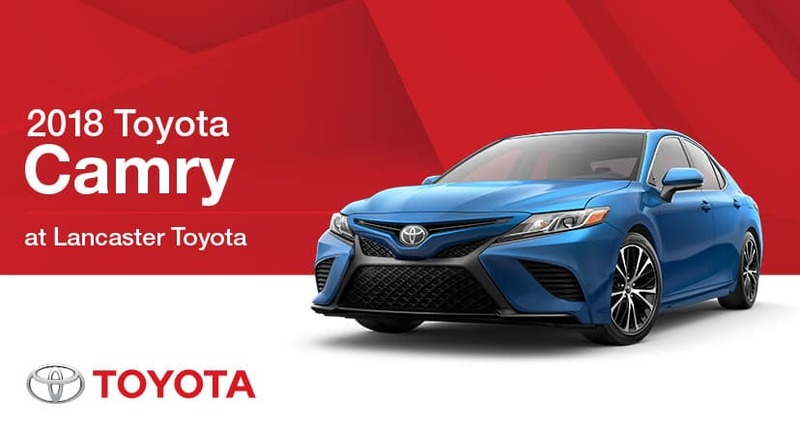 Test drive the new Toyota Camry at Lancaster Toyota. *2018 EPA mileage estimate. Actual mileage will vary.